Writing Process: How A One-Page Throwaway Gag Became A 12-Page Supporting Character. Hey, weird for me to do a process post on writing, but this is a case where reader feedback helped me see some opportunities for my characters, so I thought it’d be fun to share. 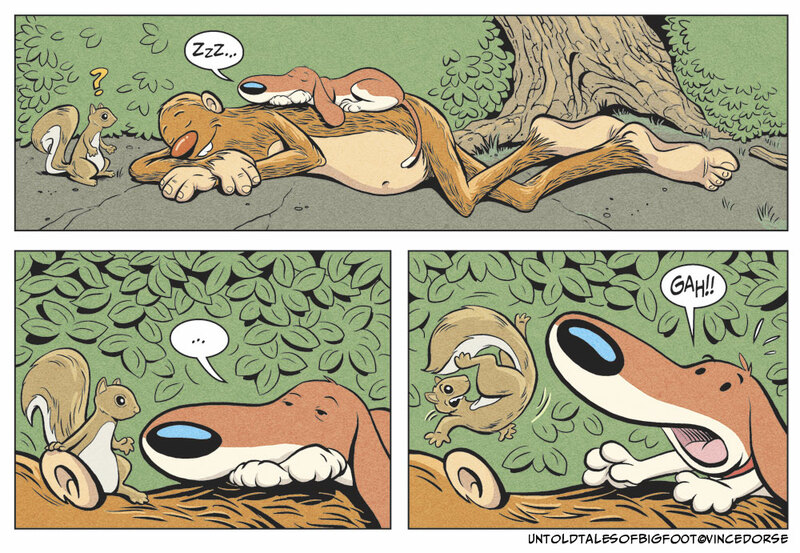 First of all, here’s some panels from page 30 of Untold Tales of Bigfoot. 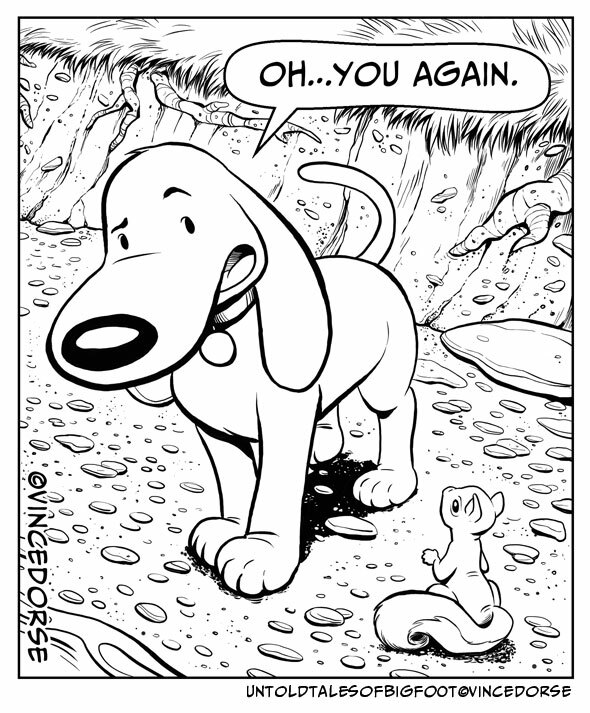 When this posted, I introduced this nameless, one-off squirrel character who startles Scout. His appearance lasted only four panels. A quick gag and he’s out. That’s all I needed him for. But I got a flood of comments and emails from readers telling me how much they enjoyed the squirrel and they wanted him back. Well, you’re outta’ luck, I thought, because he ain’t comin’ back! 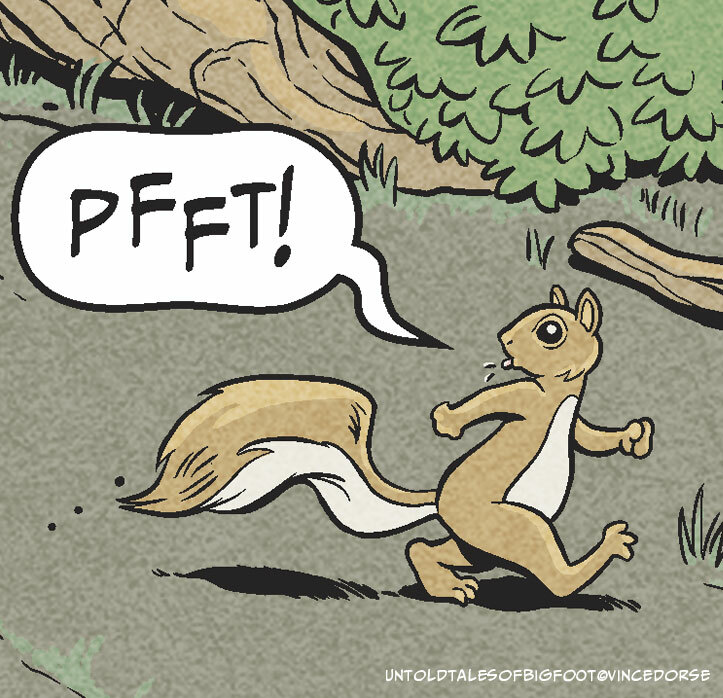 I had the whole story outlined in my head and, frankly, the squirrel was done. But it stuck in the back of my brain for months. And every once in a while someone would ask “is the squirrel coming back soon?” It got me thinking. Maybe I should take another look at the story and see if there were any spots that might benefit from bringing the squirrel back. I found one. Now I had a running gag. Scout flips out every time the squirrel sneaks up on him. But now that the squirrel’s back, what do I do with him? Turns out, at this point in the story, Scout needs a sounding board for some of his character development. He’s growing as a character and his interactions with the squirrel are a great way to show that. Bringing the squirrel back also provides some opportunities for comedic and dramatic moments that I hadn’t considered previously. The whole experience reminded me that, no matter how set you are on your story, there’s nothing wrong with taking another look at it with fresh eyes every now and then. And sometimes other people can see things that you’re too wrapped up to notice. Now that I’m readying the comic for print, I’ve been adding a page or two, here and there, to help flesh out the story. I’d be remiss if I didn’t toss in a few more panels of a certain, very popular rodent.